We sat cross-legged on the floor in a dim room with around 25 others patiently waiting for a turn before the monk. The monk looked fairly young and he didn’t speak a word to anyone. He barely looked up from his work, only occasionally glancing around at his quitely humming audience or up towards the clock. He worked swiftly and stoically. I watched him intently as he hand-tattooed person after person. The only visible sign of strain: he occasionally clenched the muscles in his jaw as he expertly tapped prayers onto the skin of his subjects with a long metal spike. Two small lizards with tails split into two parts stood motionless on the wall above him. We were the only non-Thai tattoo-seekers at the temple that day. Besides the murmur of people whispering to each other in the crowd, the only other noise in the room was the sound of a ceiling fan gently clanking in it’s orbit — adding to the growing tension in the air as we inched closer to the front of the room, closer to a turn under the needle. This all started when Jamie, Caitlin and I read an article in the Air Asia in-flight magazine about the Wai Kru Tattoo Festival, a religious event held at Wat Bang Phra each year. Hundreds of devotees flock to a small town in the Nakom Pathon province to get a Sak Yant by the monks at this famed temple. The festival sounds pretty wild, with some people going into trances, yelling and thrashing around in the crowd from the spiritual power of the blessings. The festival is in March, so we missed that, but people still line up every day of the year to get some blessed ink. I read somewhere that the monks tattoo about 30-50 people a day. 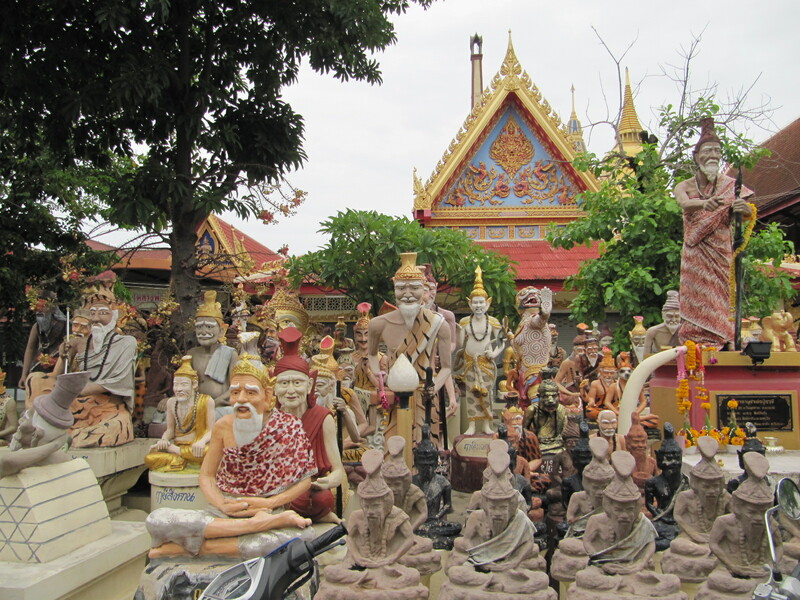 ‘It’s only about 50 km from Bangkok — we must go check this out,’ so we decided while on that plane. We got an early start and left for the temple around 6 a.m., hopping on a minivan from Victory Monument for just 60 baht a person. The minivan dropped us off on the side of a highway in seemingly the middle of nowhere, where we grabbed a cab to Wat Bang Phra. If you’re interested in going, this guy has really good directions for getting to the temple on his blog. A cast of interesting characters on the temple grounds. When we arrived at the colorful temple on the side of a small river, we found a table to purchase offerings to give to the monks. For 60 baht, the standard offering includes a little bundle of incense and candles, flowers and a pack of cigarettes. 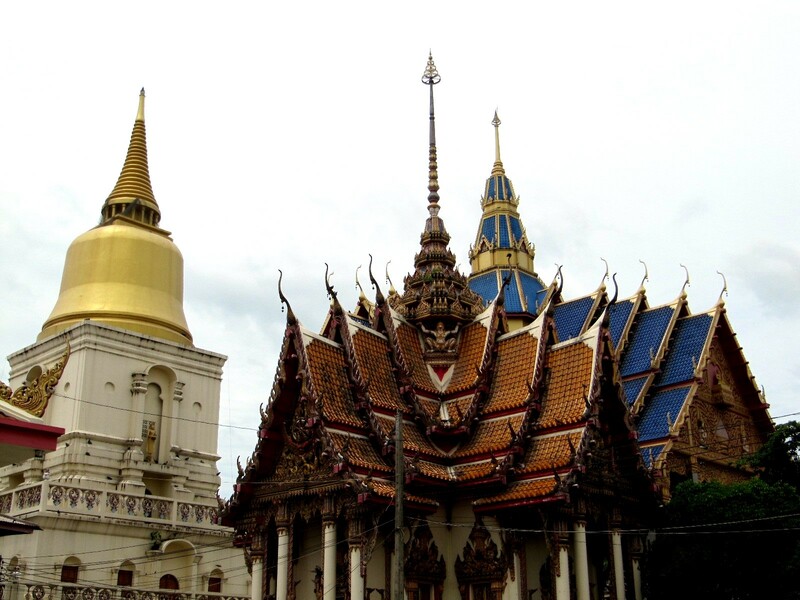 We made our way to the temple and we were directed to a room where dozens of Thai eyes watched us as we entered. We placed our offerings on a pile with the others, and sat down to wait for our turn. At one point, the crowd was called suddenly to move to the front of the room where we all bowed our heads and were told to touch each other’s backs in unity as the monk said a prayer. It was fascinating to watch to other people get tattoos, both men and women. Each person bows before the monk and then clutches a pillow while two other guys hold their skin taut for the procedure. Some guys there already had their whole backs covered in Sak Yant, adding a little piece at a time. You do not get to pick the tattoo or where it goes on your body, you go before the monk and he supposedly reads your aura and decides for you. He gets right to work, and you will only find out what the tattoo looks like when you are done. Some people get an invisible tattoo, which is a similar process but with clear ink, and still offers the protection and blessings of Sak Yant. 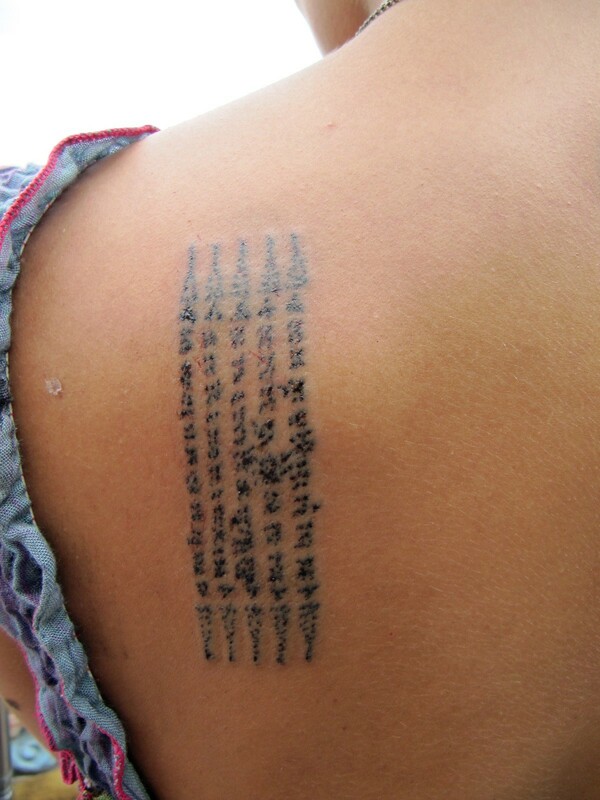 The monk chants a prayer and blows on your tattoo to breathe power into it when he is done. Many monks themselves are covered in Sak Yant, including on the tops of their heads. A little more than an hour later, and we found ourselves at the front of the room. Andrew went first, then Caitlin, then myself. The tattoos only take about 10-15 minutes each. After the first few light strikes of the stick, I thought to myself, ‘Hey this isn’t so bad,’ but then he really set to work — and it did hurt quite a bit. Though honestly I didn’t think it was as bad as a regular machine tattoo; the bamboo tattoo is a blunter pain, not as sharp and searing. And it doesn’t last too long. We didn’t get any photos as you’re not allowed to take pictures inside the temple, but if you search you can find some people who got pics. A close up of my Sak Yant. This is my second tattoo of the trip — at this rate I’ll be covered in ink my the end of the trip! Fresh ink and happy faces. Going in that morning, I wasn’t totally sure whether I was going to take the plunge, but once I was sitting in that quietly humming room before the monk, I knew there was no turning back. And I’m really glad I went through with it! I love the way it looks, and the meaning, and the whole story of behind it. (Side note: I only found out that Angelina Jolie has the same tattoo the day before, long after we decided to go to Wat Bang Phra.) This will definitely be one of my most memorable experiences in Thailand! Here’s a short video someone made about the tattoo festival. The first monk in the video, ‘Luang Pi Nunn,’ is the one who did our tattoos! Nice. We match! Looks like more and more people are visiting WBP and getting into this art. I have two of them now myself. Definitely an addiction! Yes, I’m so happy with it, very cool experience! So you went back to the temple for another tattoo? Awesome! I’m so glad my directions helped on your journey!! It looks like you had a similar, magical experience to everyone else I’ve spoken to. It really is a treasure, and such an honour to be able to participate in that sacred tradition! Thanks for the great story! We just left BKK and we are now in Chiang Mai — otherwise I would have loved to join! Thanks for the invite! Aww too bad! Chiang Mai’s lovely. I used to live up there before moving down to Bangkok. If you need any suggestions, or would like to connect to bloggers/expats up there, let me know. Enjoy!! So what about the Tattoo Law? Aren’t there 5 rules for the tattoo that you’re supposed to do (or i guess forbid from doing)? wat is your experience after getting the tattoo?? ?I meany have u come across any changes??? My name is Nigel, and I am the curator of FlyMe360° – an upcoming, modern travel magazine. We would like to publish this piece of article. Would you two care to get in touch with me at the email I’ve attached to talk about the idea? Hi Nigel! I’m glad you are interested! You can contact me at michkwu@gmail.com. I’d love to hear more about your magazine. and has removed a few of the possibility issue formerly related to shopping on the internet. place or area, on your smartphone. For users of i – OS and lots of other devices, you choices will probably be narrowed down to PPTP or L2TP. in comparison to Icon’s 1080 by 1920 pixels.